Cubis Kingdoms Collector's Edition Game - Download and Play Free Version! It's definitely not a prerequisite for a puzzle game to have a narrative, but with so many games competing for attention these days, it definitely doesn't hurt. 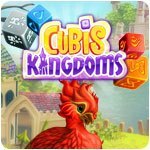 Cubis Kingdoms brings a story to the successful Cubis franchise for the first time, and along with gameplay and visual enhancements, it's enough to make for a compelling and well-crafted puzzler that doesn't feel like a retread. Before you run away kicking and screaming at the thought of another match-3 game, Cubis Kingdoms is already different from most just because it's a Cubis game. Instead of a flat board, the playing field is 3D and laid out from an isometric perspective. The playing pieces are cubes and not flat squares, because, well, Cubis. Also, you slide the cubes around two of the edges of the board before releasing them as opposed to manipulating them on the board to make matches - three or more of the same cubes matched up clears them from the board. The controls are simple and intuitive, as you simply drag a cube into the desired row and then tap it to launch. Anything else you need to do can be done with just a tap or two as well. 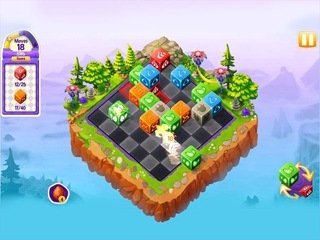 Like any good puzzler, gameplay starts out very basic and then gets more complex as you go, with additional colored cubes, obstacles that can't be moved, special power-up cubes and much more. More cubes pop up on the board itself to make things more challenging, but in Tetris-eqsue fashion, you can see where they are coming to aid in your planning. There are some unexpected subtleties too. 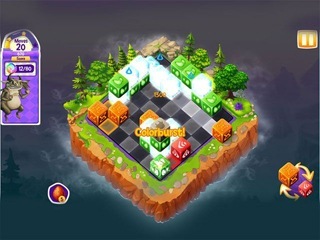 You have a choice of two different cubes most times, giving you the option of swapping between them with just a tap. And when you play cubes onto the board, you can knock the one you 'shoot' at back one square as long as there's nothing immediately behind it, allowing for some possibilities for combos you might not notice at first glance. All of this works in service of the story, which is that there's a once vibrant land that has fallen under the sway of a powerful curse. Dispelling it requires the elements you secure from making matches that become a kind of currency. You can also restore life to the regions you save (we assume encouraging them to return and not actually creating life, which would be a whole other ballgame power-wise!) using an elixir you can only get by clearing an entire board in a certain number of turns. That adds some welcome replay value. And since any story with a curse needs some villains, and Cubis Kingdoms serves them up in the form of gargoyles you encounter in special boss battle levels. Cubis Kingdoms is a step in the right direction for the series in that it's not just doing the same thing over again. Whether you come for the 'match-3 with an extra twist or two' gameplay and stay to rescue all the critters or vice versa, it's a pleasant puzzler with just the right mix of the familiar and the new.